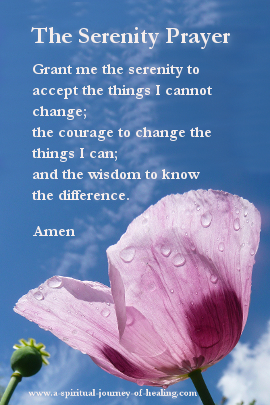 I want to share a simple and beautiful prayer of acceptance called the serenity prayer. We pray this prayer and fall into a place of acceptance in our lives. The original serenity prayer was by Reinhold Niebuhr, and includes further lines. This prayer for acceptance and guidance for change became famous when it was adopted by Alcoholics Anonymous (AA) and other twelve-step programs. 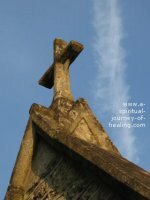 Click to read for a spirituality article by an author who found her spirituality through AA. In difficult times, living with hardship, I practised meeting the frustration and not-knowing with this prayer for guidance and acceptance. I was willing to switch from fear and desperation to trust. It can be so hard to know the difference between those things in our life we need to make an effort to change, and those things we need to meet with acceptance. It brings me comfort to hand over the decision and ask God to guide me. It feels good to affirm that I have the wisdom to distinguish between the two. There are times when it certainly doesn't feel like I have the wisdom! When life is difficult, we can be reluctant to accept things as they are. We think if we do so, they will just stay the same. But acceptance is not the same thing as resignation. It is a paradox, but when we truly sink into the present moment and accept things as we are, our lives can shift in quite magical ways. There is an answer even if I don't know what it is just yet. The Universe responds to our trust. Living With Illness – Help, I Don't Know What To Do! When you are living with chronic illness, particularly an illness which requires energy management like Myalgic Encephalomyelitis /CFS it can be so hard to know what you need to change and what you need to accept. I learned to watch out for these words and replace them with the serenity prayer. Here is another affirmation for spiritual guidance. I know what to do and I know the order in which to do it. "Aaargh, what can I do?" "Everything I do seems to be the wrong thing." I would say the affirmation for guidance and be willing to rest in the space of trusting God for the guidance I needed. To put it another way, I am willing to access the part of me that is always in touch with Divine guidance and always knows what to do. You know what to do and you know the order in which to do it. God is guiding you from a place of infinite knowing. 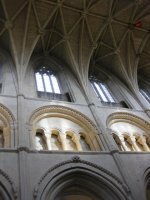 There is a FREE ebook available on this spiritual website on Releasing Judgement - Forgiveness Exercises for Self And Acceptance and Inner Peace. The free book outlines a powerful technique I developed to help me find peace and acceptance in difficult situations, receive guidance and forgive my way out. Acceptance is the final of the 7 stages of grief, and our destination. ﻿10 Tips for Finding Peace help us fall into a place of allowing things to be as they are. We allow ourselves to rest in God. A prayer for peace of mind opens us to find peace whatever the circumstances.